Kanye West has a reputation for doing New York Fashion Week his own way, and his fourth Yeezy collection for Adidas was as dramatic as ever. Never one to be restricted by the New York Fashion Week schedule, West shuttled editors outside of Manhattan and staged his show on Roosevelt Island in the East River. The show was running to a Kardashian-West timezone, and so the livestream started at 4.49pm instead of the scheduled 3pm slot (New York time). The almost two hour wait in the heat proved problematic for the models who were ‘dropping like flies’ as they attempted to stand completely still as part of a performance art piece. At the show space, which was on the site of a former smallpox hospital, a colossal runway circled around a triangular stretch of grass, where an army of Kanye’s underwear-clad models were assembled in neat rows. 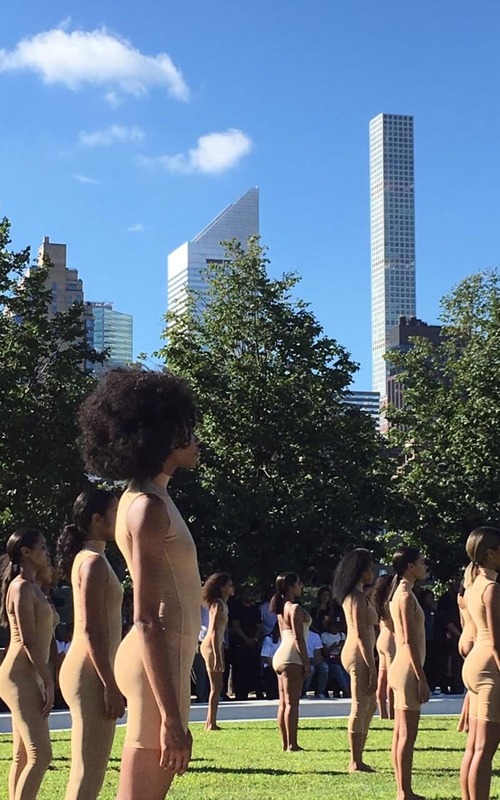 This performance art installation has become a feature at all of Kanye West’s fashion shows, and is choreographed by the Italian artist Vanessa Beecroft. But standing like statues in the New York heat proved challenging for a number of the models who were photographed crouching down on the grass and had to be given water by concerned on-lookers in the audience. The models walking in the runway show also struggled in the show, as a number of them had difficulty walking in the thigh high heeled boots. Model Amina Blue even had to resort to kicking off her perspex Yeezy heels mid-walk after attempting to hobble down the runway. Getting to the show was also not without drama, as those with invites were not told the location of the show until mere hours before it started. They were asked to assemble an hour and a half before the show time in Manhattan, and were driven out to Roosevelt Island in New York City’s East River on coaches, which many compared to school buses. 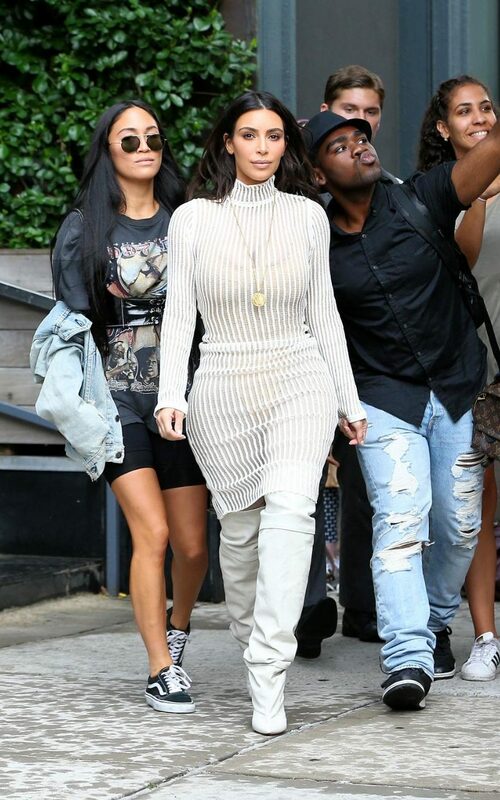 This season there was a smaller Kardashian-Jenner presence on the front row, as Kim Kardashian, Kendall Jenner and Kylie Jenner were the only family members in the audience this time – all wearing their own Yeezy Season 4, of course, and studiously Snapchatting the whole thing. As for the recognisable faces on the runway, supermodel Chanel Iman closed the show and Sofia Richie – daughter of Lionel Richie – made her catwalk debut in an oversized lime green hoodie.